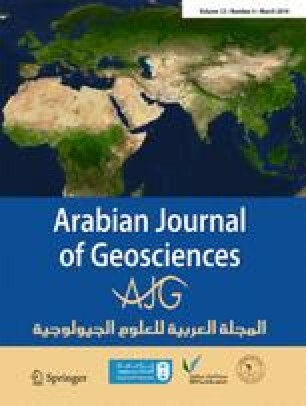 The present study makes an attempt to utilize reservoir parameters which have been integrated into Arc GIS to delineate hydrocarbon potential zones in Masila oil field, Yemen. Petrophysical analysis has been carried out for a set of well logs data using Schlumberger Techlog software. Reservoir parameters calculated from well logs analysis include effective porosity (PHIE), permeability (K), Net-Pay thickness (N-PTh), hydrocarbon saturation (Sh), water saturation (Swe), the volume of shale (Vsh), and fault system (Fs). Petrophysical parameters prepared as contour maps, converted into raster format, classified and visualized as 2D/3D on GIS platform. Frequency ration model has been used to assess weighting score for each parameter with the help of existing wells location. Themes of reservoir parameters are reclassified by using weightage score of frequency ratio model. The result obtained from analyses of reservoir properties concluded that total effective porosity ranges between 17 and 38%, permeability between 108.89 and 903.30 mD, net-pay thickness 25–189.30 m, volume of shale 9–27%, water saturation 14–77%, and hydrocarbon saturation 73–86%, which is mostly concentrated in NW and SW in the study area. These parts of oil field reveal promising reservoir characteristics and have more hydrocarbon potential due to high values of permeability, porosity, and hydrocarbon saturation and less values of water saturation and volume of shale. The area is categorized into five potential zones, viz., very high, high, moderate, low, and very low. Reservoir cross plots of hydrocarbon occurrence have been used to validate the new potential zones. The result of overlay has shown very good correlation with the present ground situation. The outcome of this research will contribute to the development of the existing oil fields; besides, it will provide a superior database and will lead to improvement in decision-making to achieve higher hydrocarbon exploration and production. The authors are grateful to petroleum exploration and production authority, Yemen, for providing the data used in this study. Thanks are due to Geological Survey and Mineral Sources Board, Yemen, for providing geological data.